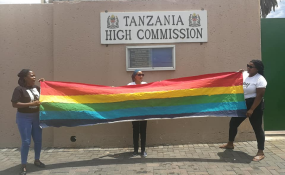 Lobby group protest against anti-queer action in Tanzania. Paul Makonda, the governor of Dar es Salaam in Tanzania, has deployed a surveillance squad, to track down queer people on social media. Homosexuality is illegal in Tanzania, and anti-gay narratives have been prevalent since President John Magufuli’s instatement in 2015.
we call on you to recognize the current situation in Tanzania, and the abuse of human rights and right to freedom. Tell governor Paul Makonda that you do not accept his behaviour, by making a public statement condemning the surveillance squad, arrests and shutting down of HIV clinics. We call on you to offer asylum to queer Tanzanians, who are in danger of their freedom being taken away from them. We call on you to act according to our constitution and your attitude of protecting queer rights in South Africa. Show queer people in Africa you are serious about queer rights and take a stand against homophobia. Copyright © 2018 Amandla.mobi. All rights reserved. Distributed by AllAfrica Global Media (allAfrica.com).